P.I.C. NEWS:	The official newletter of P.I.C. TOONS Studios! MESSIANIC COMICS' GALLERY: Messianic Comics proudly presents our art gallery with news and photos of art exhibits featuring artwork from the AN ACT OF FAITH graphic novel series! INTERVIEWS: Find out what ARGGH!!! creators have to say when interviewed by the Web's best sites!!! COMIC BOOK CREATORS' QUOTES: Quotes from our favorite comic book creators about the comic book industry! 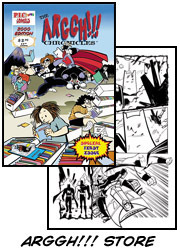 YA CAN'T ERASE INK...: YA CAN’T ERASE INK focuses on the comic book industry from a professional comic book creator's perspective. Here are some reflections on The Creator’s Bill of Rights, as well as discussions on comic book Creators' Rights by the likes of Scott McCloud, Dave Sim, Steve Bissette, Rick Veitch, Al Nickerson and more. CREATOR'S RIGHTS FORUM:Stop by the CREATOR'S RIGHTS FORUM to discuss the rights of comic book creators, contracts, comics, and other Creator’s Rights topics. CONTACT P.I.C. TOONS STUDIOS:E-mail or snail mail us!